At their most basic level, budget debates in Washington are about "who gets what" and "who pays for it." In other words, how do tax and spending policies redistribute income? Unfortunately, lawmakers tend to consider tax and spending issues in isolation rather than as two sides of the same coin. And this is very important since the line between tax and spending policy has become increasingly blurred in recent years as, for example, refundable tax credits have replaced direct spending programs as the preferred method of aiding low-to-middle income households. After enacting tax and spending policies, lawmakers should have a basic understanding of what might be called a "fiscal accounting" of the amount of government benefits families receive compared to what they pay in taxes. This fiscal accounting ensures that tax and spending policies benefit their intended parties while meeting the broader social standards of fairness. Until recently, no organization in Washington has ventured to comprehensively measure the distribution of federal taxes and spending—a technique known as "fiscal incidence" analysis. The Tax Foundation's Fiscal Incidence project is stepping forward to fill this void. Our Fiscal Incidence Model compares the distribution of all federal taxes to the distribution of all federal spending, calculating how much each family pays in taxes versus how much they get in government spending-in other words, each family's fiscal accounting. These individual results sum up into a national accounting of how much tax and spending policies combine to redistribute income from some Americans to others. What Is the Current State of Income Redistribution by the Federal Government? The results of this analysis show that federal tax and spending policies are already very heavily tilted to the poor and middle-class, even before we consider the Obama administration's budget proposals. Indeed, in 2010, before any of Obama's major policy initiatives-such as health care reform, cap and trade, and tax rate increases-are enacted, the bottom 60 percent of American families will as a group receive more in government spending than they pay in taxes. 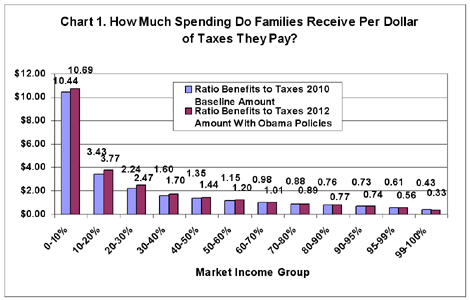 The lowest-income families will be targeted for $10.44 in spending for every dollar they pay in taxe Remarkably, families in the middle-income group—who are the target of many Obama policies—already receive $1.15 for every dollar they pay in taxes (see the light blue columns in Chart 1). By contrast, the top 40 percent of families pay more in taxes as a group than they receive in government spending benefits. In the case of the highest-income families, they are currently targeted for 43 cents in government spending for every dollar they pay in taxes, even though they disproportionately benefit from public goods such as national defense. Obama's tax and spending policies will, as advertised, further shift the tax burden toward upper-income families and spending policies to lower- and middle-income families. Surprisingly, Obama's policies will increase the number of families who are net "receivers" of government spending (those who get more back than they pay in taxes). As a group, the bottom 70 percent of families will be net receivers of government spending under Obama policies, up from the 60 percent who are collectively net receivers under today's policies. Of course this means that the number of "givers" will collectively shrink from the top 40 percent of families to the top 30 percent. The first step in measuring a family's fiscal accounting is to estimate their total federal tax burden from all sources. Next, we estimate the benefits they receive from all federal spending programs and then subtract taxes paid from benefits received to get their net fiscal position. In the presentation below, we compare the change in families' fiscal accounting between 2010 and 2012, when all of Obama's major policies are expected to be in place. It should be noted that a small portion of these changes are due to policies that are built into current law and may have occurred otherwise.1 However, for the sake of simplicity in the presentation we ascribe all of the changes to Obama who, like all presidents, will ultimately own all federal policy by the fourth year of his administration. Government relies on a variety of taxes to fund federal spending programs. 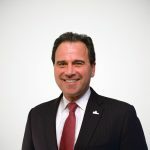 The principal ones are taxes on personal and corporate income to fund general operations, payroll taxes to fund health and retirement programs, and excise taxes to fund dedicated programs such as highways and public transportation. Each of these taxes impacts families differently depending upon such things as their incomes, spending habits, investments, employment and geography. Under Obama's tax policies, some already enacted and some proposed, families below the 20th percentile (roughly $23,700 in market income) and those above the 95th percentile (about $280,000) will see their tax payments go up in real dollars, but for very different reasons. Low-income families will be disproportionately affected by regressive cap-and-trade policies and higher tobacco taxes. Here on the tax side of the equation, these new, higher taxes hit low-income families hard. One might expect that Obama's "Making Work Pay" tax credit would balance these new burdens out, but much of that refundable credit's benefit counts as spending rather than as tax relief. a) This is the market income cutoff in 2010. The cutoff in 2012 will be slightly higher due to inflation and wage growth. For the highest income families (all those above $712,000 in total market income), Obama's plan to raise the top tax rates of 33 and 35 percent to 36 and 39.6 percent will boost their average taxes by more than $91,000 in 2012 (after adjusting for inflation) from more than $660,000 to roughly $752,000. Families' circumstances and stages of life also affect the types of government spending they benefit from and how much, although to some degree every family benefits from public goods such as national defense and public health programs. Low-income families tend to benefit most from social services and welfare programs such as food stamps, subsidized housing, Medicaid, and unemployment insurance. Meanwhile, upper-income families tend to benefit most from national defense (a benefit assumed here to be proportionate to their income), education spending (more children live in middle- to upper-income families), and subsidies for agriculture and transportation. Table 2 shows that a family in the lowest income group (below $11,250) receives $17,617 in government benefits from all sources under current policies. This amount will grow in real terms by $2,440 under Obama's policies to more than $20,000. As Chart 1 indicates, their spending received goes up to $10.69 per dollar of tax in 2012 compared to $10.44 per dollar in 2010. As a group, families below the 60th percentile (roughly $86,000) will see their spending benefits go up in real terms under Obama's policies while those earning above that threshold will see their spending benefits decline. Readers might be surprised to see that the group that suffers the largest monetary drop in spending benefits is the wealthiest Americans. This is because national defense spending is assumed to benefit them proportionately to their incomes, and so as defense spending drops under Obama's budget, they will see the biggest loss of "benefits." The last step to understanding whether families are "net receivers" from government or "net contributors" is to subtract their total spending benefits from their total tax bill. As Table 3 shows, under current policies all families up to the 60th percentile ($86,000) receive more in government spending benefits than they pay in taxes. For those in the lowest income groups this totals nearly $16,000 more in benefits received than they pay in taxes. Even those in the middle-income group currently receive roughly $2,600 more in government spending than they pay in taxes. The flip side of this equation is even more dramatic at the top where the taxes paid by the wealthiest families swamp any benefits they receive from government. On average, families in the 95th to 99th percentiles pay roughly $43,000 more in taxes than they receive in benefits while those at the top pay more than $377,000 more in taxes than they get back in benefits. Table 3 shows that relative to 2010, families below the 60th percentile will, on average, see a substantial increase in their net return from government in 2012. Families in the lowest income group will see their net return grow by $2,251, after adjusting for inflation, while those just above the middle of the income spectrum (50th to 60th percentile) will see their real return grow by nearly $900. Meanwhile, Obama's policies do increase the redistribution from the top 5 percent of families as he promised. The net amount of income redistributed from families in the 95th – 99th percentiles will increase by more than $4,600, after adjusting for inflation, while the top 1 percent of families will lose more than $127,000 in income on average in today's dollars. By contrast, families between the 70th and 95th percentiles will see the amount of income redistributed from them decline slightly, though they will remain net contributors to government. The most interesting development is for families in the 60th to 70th percentile, who under current policies are on average net contributors but will become net receivers of government spending under Obama policies. These means, of course, that as a group the bottom 70 percent of families will get more back from government than they pay in taxes, up from the current mark where the bottom 60 percent of families are collectively net receivers. On the flip side, it also means that the top 30 percent of families will collectively be net contributors, whereas the top 40 percent are net payers today. The decisions lawmakers make over the budget and policy issues such as health care reform and climate change will have a substantial impact on the balance of what families pay in taxes and the amount of government spending benefits they receive in return. Therefore it is critical that lawmakers begin these debates with a benchmark for the "fiscal accounting" of families at different income levels and how these policies will affect the amount of redistribution from some Americans to others. New results from the Tax Foundation's Fiscal Incidence Model show that even before any of Obama's policies are enacted, the bottom 60 percent of American families as a group get more back in federal government spending benefits than they pay in federal taxes. Indeed, even those families in the statistical middle income group are on average net receivers of government benefits. Obama's policies will, as promised, increase the load on the wealthiest families by an average of more than $127,000 in today's dollars, while increasing the number of American families who are on average net receivers of government spending. Under Obama's policies, most families up to the 70th percentile—those earning up to $109,000—will, on average, get more back from government than they pay in taxes. The decision for lawmakers and taxpayers alike is whether or not America can afford to have so many citizens benefiting at the expense of so few. 1. See Tax Foundation Special Report, No. 172, for more explanation of Obama's policy changes versus current law or "baseline" policy. 2. For a full explanation of how taxes are allocated to each income group, see forthcoming Tax Foundation Working Paper, No. 7. To learn more about this topic, watch the Tax Foundation slide show on redistribution and the impact of Obama's policies.